As for 2 of January we’re migrating to a new company name! Watts’on used to stand for awareness around Google Maps. As a Google Maps for business reseller and implementation partner, we find this doesn’t reflect our actual mind set. Together with Google, we believe everything around location is the next step forward towards everyone’s business. Location is a strategy for our customers. A mind set. It’s inevitable to start a business without thinking of your location strategy, whether it is for measuring the potential interaction with your customers or business partners or whether it’s to understand your past, current or future plans, you always need to use and understand location based information. Together we can look for the beneficial location data that will help your company grow in the verticals you desire. 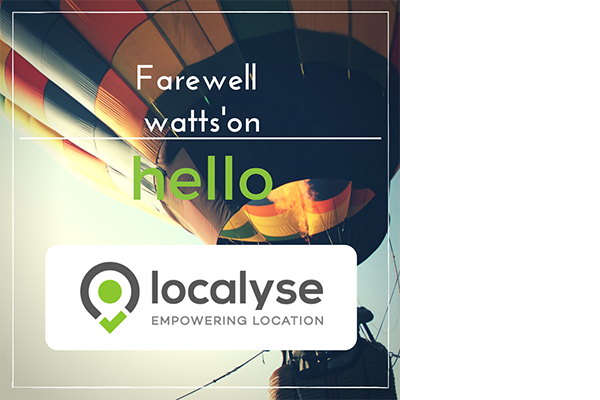 Localyse is your expert for location-related questions. We are able to investigate, develop and execute the best practices around the possibilities for Google Maps products and services. Our products, services and latest posts are available on our website. Current company information (address, VAT, telephone etc.) will stay the same. For questions or contact please visit our website. Last but not least: We wish you a great start into 2017!